Neil deGrasse Tyson is a rock star to many people – definitely an odd descriptor for an astrophysicist who is Director of the Hayden Planetarium at the American Museum of Natural History in New York City. Many consider him to be today’s Carl Sagan – and I find it interesting that (at least to me) he talks and sounds like Dr. Sagan. No matter in his role as director, author, speaker, interviewee, or television show host, Dr. deGrasse Tyson exudes enthusiasm and commitment to his craft and passion – science – just as Carl Sagan did. Images of deep space capture a sense of awesome for me – which is one of the reasons I use them as headers on this blog. (Click here to see past headers.) As a geek interested in the intersection of science and religion, those images give me a greater sense of creation. These points, along with interviews I saw with Dr. deGrasse Tyson, his 2017 book became a must-read for me. Astrophysics for People in a Hurry is a short read (about 200 pages) that made it to the top of the New York Times Best-Seller list. This book is about time, space, particles, forces, and how they fit together in the universe according to the laws of the universe. Yes, he takes readers into complex topics as the Big Bang, dark matter, and dark energy – but he does it with relative simplicity with wit, real-world application, and enthusiasm. Even with his wit and understandable writing style, the topic isn’t naturally easy for all – so I had head scratching. Neil deGrasse Tyson is an excellent communicator and I can hear his voice in his words. This booked helped me understand my awe with deep space and creation. He promotes the cosmic perspective from the frontiers; which he describes as humbling, spiritual, redemptive, mind opening, eye opening, transcending, wise, insightful, finding beauty, enabling one to see beyond in order to embrace chemical and genetic kinship, and more. Now that is for me! I encourage readers to take the time to embrace Astrophysics for People in a Hurry. Besides, it could be a stocking stuffer as a holiday gift. Here’s the link for the book on Amazon. I end this review with a fantastic video on a similar topic from Symphony of Science featuring Neil deGrasse Tyson. Science – the search for the explanation of what we observe in nature. Science – a body of organized knowledge that describes the properties and interactions of the material components of the universe. Science – a human endeavor limited to the human perspective seeking to understand and explain phenomena occurring in the natural world and the laboratory. Science – a dynamic (not static) intellectual human endeavor leading us to a deeper understanding of the natural world. Science – an impersonal process requiring a trained mind with passion, imagination, and patience for details to find patterns, structure, connections, and history within nature. Science – a data-gathering process so we can better understand ourselves, the natural world around us, and our place in this world. Science – a process with accepted methodologies trained mind works uses while fighting misconceptions, mistaken observations, and inadequate conclusions. Science – an intellectual activity using the senses and technology to extend the senses for gathering data to develop an explanation based on evidence and what is already known. Science – a process and activity requiring a conscious mind that observes, inquires, organizes, interprets, understands, and a willingness to follow acceptable scientific methodologies while staying within nature’s boundaries – yet that does not mean that nothing exists outside of nature’s boundaries. Science – the study of the material, processes, and forces of the natural world. Science – not a belief system, but a learning system involving the exploration of natural causes to explain natural phenomena through systemic processes and procedures. Science – an empirical human endeavor by establishing questions of truth through experimenting and testing without absolutes while remaining open to retesting and reconsideration. Science – a gift as it brings us new knowledge, yet knowledge that is only for a given point in time because it can change based on newer knowledge. Because of potential development of new knowledge, science must be willing to have what is currently known to be proven wrong. Science – a system giving us gives theories: a structure of ideas based on large amounts of evidence that explain and interpret numerous facts about a concept – therefore, well beyond a personal opinion or a detective’s hunch. Science – a habit of mind of careful sifting of data and withholding of final judgment. Science – a methodology that does not make moral, ethical, and value judgments for society because those judgments are made by society. Science – a way of knowing, but not the only way because science does not corner the way to truth about everything. Philosophical, theological, psychological/emotional, ethical, political, and historical views provide additional perspectives, yet each discipline is selective and limited. Science – a process with recognized limitations. Science does not state how to use its knowledge. Science does not make value judgments. Science is limited to studying in nature. Science is limited to our ability to observe, including technology’s limitations. Science does not operate outside of its defined methodologies. Science – a study that is limited to itself. Science cannot prove or disprove God’s existence because that question/topic lies outside science’s self-imposed boundaries of the observable events in the natural world around us. Science – a study that should be embraced by all. Friday afternoon I stumbled across an interesting tidbit – that is, this weekend is Carl Sagan Day – marked by the his birthday (November 9) – thus, this unplanned post. 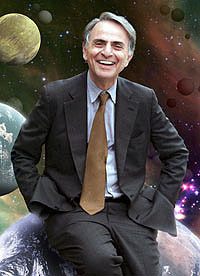 We can put many tags on Dr. Sagan – take your pick – scientist, astronomer, author, philosopher, cosmologist, astrophysicist, professor, television personality, and others. To me, and no matter the role, there are two facts that stand above others: he was a tireless promoter of science, plus he stood in awe of universe. The article that sparked this post was this small collection of his inspirational quotes. To celebrate this day, I’ve taken two of the quotes from the article, plus two others, and then supported them in my style of adding videos … or maybe I simply needed an excuse to display one of my all-time favorites. Enjoy … which was your favorite? Do you know my favorite? I am a collection of water, calcium and organic molecules called Carl Sagan. You are a collection of almost identical molecules with a different collective label. But is that all? Is there nothing in here but molecules? Some people find this idea somehow demeaning to human dignity. For myself, I find it elevating that our universe permits the evolution of molecular machines as intricate and subtle as we. What distinguishes our species is thought. The cerebral cortex is in a way a liberation. We need no longer be trapped in the genetically inherited behavior patterns of lizards and baboons: territoriality and aggression and dominance hierarchies. We are each of us largely responsible for what gets put in to our brains. For what as adults we wind up caring for and knowing about. No longer at the mercy of the reptile brain, we can change ourselves. Think of the possibilities. The purpose of the Exploring series was to serve as a break from normal blogging activities while allowing everyone to be intrigued. While we are in space, there is a place where monsters hide. Let’s take a peak. Enjoy this wonderful video from Symphony of Science. What thoughts did this cause you to think about? Whenever comparing items, we need references as a perspective. A mouse is small to us, but we are small compared to a blue whale, and the mouse is large compared to one of its cells. Yet, that same whale is small compared to Mt. Everest, which is a meager spot on or planet – but Earth is so small compared to Jupiter. The pattern can continue to the Sun, our solar system, to the Milky Way, all the way to the universe. Oh, the wonders that creation provides. Wonder continue as we go in the opposite direction by examining our cells, to cell parts, to the molecule, its atoms, the atomic parts, and even to the smaller quarks. Each microliter of human blood has approximately 5 million red blood cells (RBC). Considering that 1 liter contains 1 million microliters, and humans have 5 liters of blood, the total number of RBCs in each of us is quite large. Toss in the fact that each RBC contains 250 million molecules of hemoglobin that is responsible for transporting oxygen and carbon dioxide through over 60,000 miles of blood vessels – and this is in each of us. As social beings, each of us know many people – well, we think we do – but compared to the world population, are interactions are limited to a mere few. Encounters of the cyberkind expand our world, but it is still small. Each of us have countless daily interactions – some positive, others negative, and most have little effect. Sometimes we know when we affect the life of another, but much of the time, we stand in a clueless abyss. After all, we do not know when the effect of that encounter is transferred to others – perhaps even years later. Toss in the element of time – all the people who passed before me, and all those who lie ahead of my time. People born, people die. A few become notables, most are commoners. Some are giants to societies. Some are giants in their towns, while others are giants in a family – but many are simply everyday people playing a niche in life. Yes, we all have history and in time, forgotten. Of all these people, only a selected few have recognized names of distinction – and only a few of them will make history books. I am only 1 of over 7 billion people on our planet at this time, and only 1 of about 108 billion humans born to through the ages. In some way, these thoughts make me feel worthless. On the other hand, science – and yes, my Christian views – allow me to appreciate being a tiny speck living on a particle of dust in the universe that is vast and intricate – thus I impressed and overwhelmed. Many of us had a traditional/classical physics course in high school. In not, you received an introduction in a physical science class. Today though, we must lightly differentiate classical physics and quantum physics. While the foundations for classical physics are more than 500 years old, the formations of quantum physics dates back to the early 1900s. By the 1920s, the work by famous names as Max Born, Neils Bohr, Albert Einstein, Werner Heisenberg, Max Planck, and others began to bring quantum physics into the main stream. Today, quantum physicists led advanced developments and a deeper understanding in physics. The Heisenberg Uncertainty Principle examines the limits of accuracy in the interactions between matter and energy – or as I have like to think, an explanation of the certainty of uncertainty and how uncertainty is definitely certain. Because I’m not a physicist, there are several purposes of this post. First, in my studies of the intersection of religion and science, authors frequently used quantum physics in various explanations. Interestingly, several theologians specializing in this subject are also physicists. Secondly, I share an interest about the intersection with Nancy, the author at Conversation in Faith as she wrote, not so long ago, this worthwhile post about Physics and Faith. Lastly, I have featured Symphony in Science on more than one occasion – and one of the more recent ones is about quantum physics. Enjoy the learning experience to music.